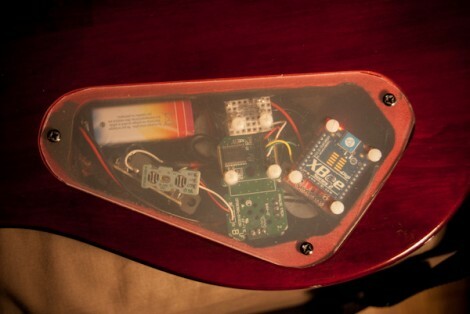 [JP Carrascal] hacked his guitar by adding motion control while removing the need for wires. He’s using a dual-Arduino system with an Mini Pro inside the guitar and a Duemilanova for the receiver connected to a computer. Wireless is provided by the XBee module seen above and a gutted Wii remote accelerometer is in there for motion sensing. Check out the artfully blurry demonstration of the motion effects after the break. While he added some potentiometer-based controls there is also an automatic power-down feature. [JP] replaced the mono pickup with a stereo one and used the extra conductor as a switch to activate the additional electronics. We wonder if he also winds his own pickups or builds his own effects pedals. [Karl-Engelbert Wenzel] developed a UAV capable of taking off and landing on a moving platform autonomously. 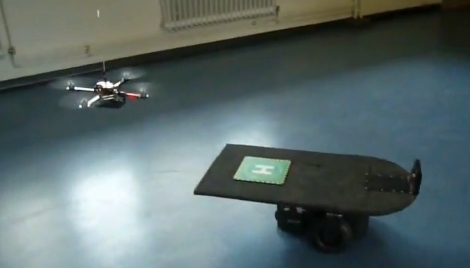 The platform operates aircraft-carrier-style by driving around the room in circles. The quadcopter tracks a grid of IR LEDs at the front of the landing deck by using the IR camera from a Wii remote. The best part is that the flight controls and processing are all done by the copter’s onboard ATmega644 processor, not requiring a connection to a PC. The landings are quite accurate, achieving a maximum error of less than 40 centimeters. In the video after the break you can see the first landing is slightly off the mark but the next two are dead on target. So build yourself a mobile platform and pair it up with your newly finished quadcopter to replicate this delightful hack. Shortly after finishing his Makiwara punching bag, [Abieneman] wired and programmed an Arduino to an accelerometer to find out just how much acceleration (and with some math, force) is behind his punches. 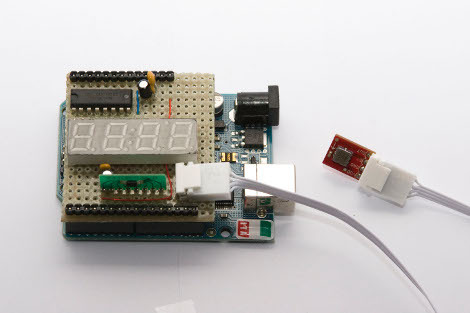 The project is simple and would be quick to reproduce for your own measuring and experiments: all that he used included an Arduino, accelerometer (with A/D converter), LED displays (and shift register). We were a little disappointed to learn of how much static the accelerometer produced, so measuring things such as impulse, energy, and pretty much anything not kinematic is nullified. But it makes us wonder, how much static would be in say, a Wii Remote punching bag? Create Digital Music Wrote a semi guide for Linux music creation and interaction after interviewing the L2Ork group. L2Ork is a Virginia Tech based Orchestra that use only laptops loaded with a custom Linux kernel, Wii remotes, and home built speaker salad bowls to produce some surprisingly amazing music. We’ve seen music creation from Wii Remotes before, but it didn’t sound anything like what L2Ork has created. The best part of the project, there are several videos and guides produced by L2Ork so you don’t have to attend Virginia Tech to produce your own music. [Ico Doornekamp] sent us his ultrasonic-entirely code based-thermin project in response to yesterdays Virtual theremin. By using the programming environment Pure Data, he is able to transform his laptop into a dual input device (while only using a single microphone) without modification. By being so open-ended theoretically anyone can have a theremin within a few moments of downloading, but he does mention it might not work on all hardware. Also in relation to yesterday’s use of a Wii remote [blobKat] let us know about his thesis project, performance based music making. After studying the connection between musicians and their use of laptops decided that they would want more interaction and movement in their music creation. He combined gesture recognition and synth based movement with Wii remotes to achieve his ends. The video above is an explanation and example of his efforts.